Want to make the perfect Black and Tan but don't want to bend a spoon? The Lagerhead is your answer. 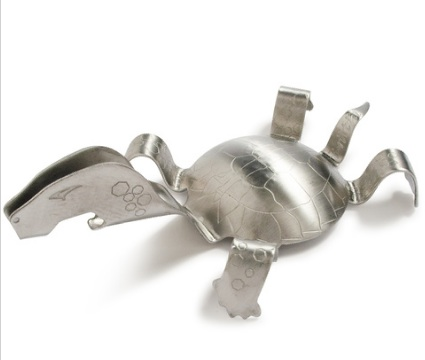 A formed piece of stainless steel shaped like a snapping turtle, the Lagerhead fits over the rim of the glass. Your nitrogenated stout is then poured over the "shell" of the turtle, creating the perfect Black and Tan. The "mouth" of the unit doubles as a bottle opener. You can also create other drinks with different beverages - try a "Snapper", Murphy's Irish Stout and Redhook ESB, or a "Snakebite", Guinness and hard cider. How about a "Bohemian", Pilsner Urquell and Beamish.